Do you love meatball subs? 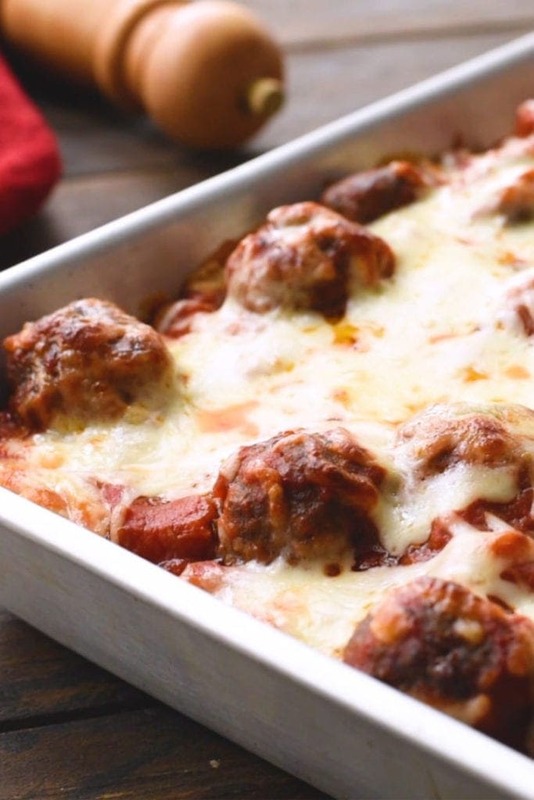 Now you can have your favorite meatball sub in this hearty casserole! 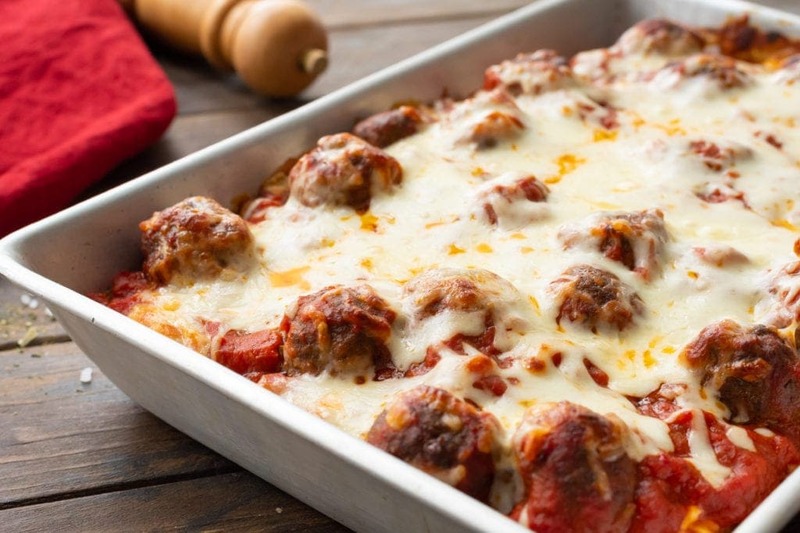 Meatball Sub Casserole combines all your favorite flavors of the classic sub. The perfect comfort food recipe. A layer of toasted french bread topped with cream cheese layer, spaghetti sauce, meatballs and cheese. We love making this and it’s so easy! 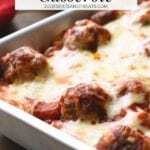 I’ts one of the best casserole recipes and it freezes great! I feel like it will never end! Seriously though, I know it’s the end of February and March is right around the corner. This is the hardest part of the season. You’re waiting for spring, but March is usually the snowiest month and by now. I’m seriously over it. You can relate right? That’s why we need more casserole recipes in our life! 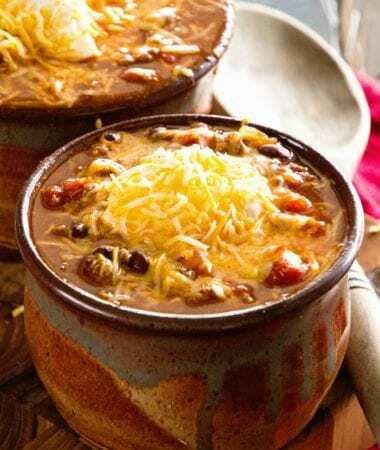 Delicious recipes that are easy to make and will warm you up on a cold day! 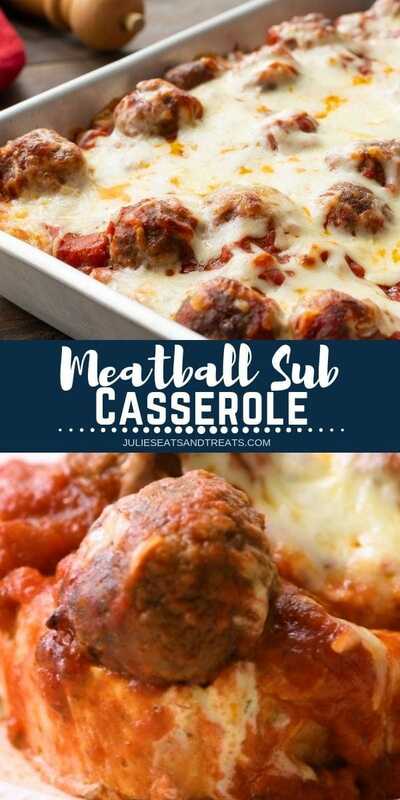 Lasagna Casserole, Baked Spaghetti Casserole or Cheesy Chicken Noodle Casserole all great choices so I’m adding one more – Meatball Sub Casserole! 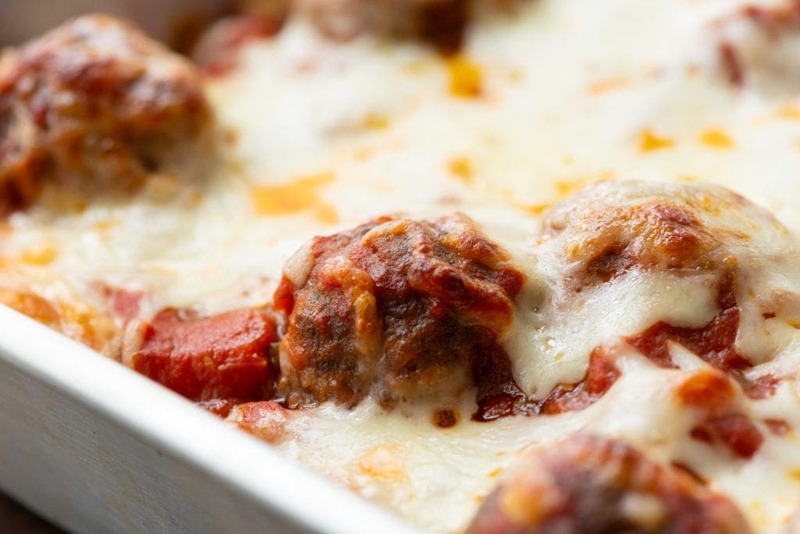 This is a hearty, yummy casserole perfect for those cool days that seem to be here to stay. I knew when I saw this I had to try it. It comes together so fast and easy. I used pre-made meatballs, toasted the bread a little so it would stay firm. I did wonder when I was making this if I was going to end up with a soggy mess. This is also what my mom asked when I told her about this! I’m proud to report that it doesn’t turn into a soggy mess! My family loves casseroles and so do I! Although we refer to them as “Hot Dishes” since we are from Minnesota. Meat, sauce and cheese! Heavenly huh? But a casserole needs the right dish. A great casserole dish will be oven safe. Some are deep, others are more shallow. Metal is usually lighter, ceramic can be heaven once it’s filled. I like a dish that is pretty enough to go from the oven right to the table. Here are some of my favorites! For all you farmer’s wives out there this would be a PERFECT casserole to bring out to the meal and would have the guys coming back for seconds. I know if you are anything like us you are always on the look out for new meals to bring out! Arrange slices of bread in one layer in the casserole dish. If there are gaps, fill them in with smaller chunks of bread. Next combine cream cheese, mayonnaise and seasonings. Spread over bread slices. Sprinkle with shredded mozzarella cheese. Combine the spaghetti sauce and meatballs. Spoon over cheese. Sprinkle with remaining cheese. Bake until hot and bubbly! What’s your favorite meal in the winter? Be sure to comment below, I definitely want to hear from you!!! And if you’re like me and snap photos of everything you eat, tag me on Instagram @julieseatsandtreats or #julieseatsandtreats that way I’m sure to see how this turned out for you!! One of the best casserole recipes! 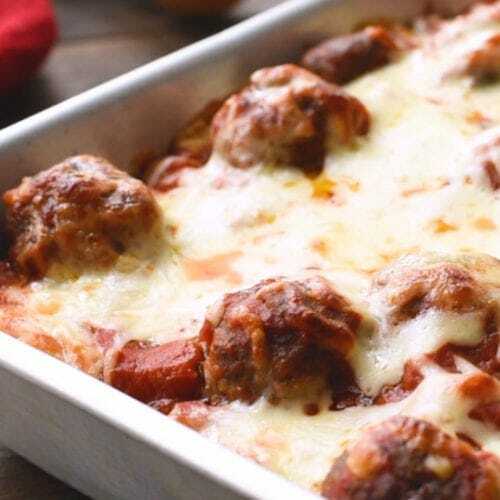 Meatball Sub Casserole is layered with toasted french bread, cream cheese, spaghetti sauce, meatballs and cheese! Arrange bread slices in a single layer in an ungreased 9×13 baking dish. Fill in gaps with smaller chunks of bread. In a bowl, combine cream cheese, mayonnaise and seasonings. Spread mixture over bread slices. Sprinkle with 1/2 c. shredded mozzarella cheese. Gently mix together spaghetti sauce and meatballs. Spoon over cheese. Sprinkle with remaining cheese. Y’alll have me a little nervous about using the mayo and cream cheese. I used 1/4 cup of mayo instead of half and 6oz cream cheese. My husband loves meatball subs and say it already smells good in the oven. He is not a mayo fan but I am and it helped spread the cream cheese over it. Overall I’m sure he and I will both eat it! Thanks for this easy recipe! A great adjustment to hide if from the mayo hating husband! It does sound weird and I don’t love a strong mayo flavor but I love this casserole! Hope you both enjoyed it! Could you use sour cream instead of mayo perhaps? Friends loved this everyone asked for recipe easy to make, will make it again. Haven’t found a brand of frozen meatballs the family likes. I’m. Thinking of making my own. Do you think I should precook them and freeze them or just put them in unfrozen? I would for sure precook them! I don’t know if you need to freeze them unless you plan on making them a while ahead of time! Julie! You hit it out of the park with this one. So ridiculously delicious! Thanks! It’s a family fave of ours too! 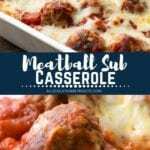 My family loves meatball subs, and they ended up loving this recipe! Cant wait to make it again!